The 1930s and 1940s are remembered as the golden era of Hollywood, when monumental films were made and stars were born. Some emerged slowly, but Errol Flynn took the world by storm. His acting talent, gorgeous face and handsome build put him on movie screens everywhere and kept him there for nearly 30 years. To moviegoers, Flynn was a dashing, noble romancer. To his friends, he was a mischievous, witty prankster. In all, he was loved and appreciated by fans everywhere. Errol Leslie Thomson Flynn was born in the British Commonwealth seaport of Hobart, Tasmania, Australia on June 20, 1909 to Marelle Young and Theodore Thomas Flynn. His father, a distinguished marine biologist, introduced him to the sea at a very young age. Flynn always said the one true love of his life was the ocean. As a child, he excelled in athletics but never chose to be an academic. He attended a number of private schools, spending only a short time at each. By the time he turned twenty, Flynn had already traveled to Sydney, Australia and New Guinea and had attempted several jobs, none lasting more than a few months. Finally, he bought a boat, The Sirocco, and sailed back to New Guinea where he became the manager of a tobacco plantation and wrote for The Sydney Bulletin about life in New Guinea. In 1933, fate stepped into Flynn's life. An Australian film producer saw a photograph of him and offered him a part in his movie, In the Wake of the Bounty. Flynn had no acting experience, but curiosity drove him to accept the offer. In this job, he found his hidden passion. After Bounty, he felt his new career would not flourish in Australia, so he sailed to London where he could expand his acting career. Flynn acted at the Northampton Repertory Company for a year and a half. His acting developed well at Northampton, and he was soon offered a contract with Warner Brothers-Teddington studios in England. The managing director offered Flynn a contract before ever seeing him act. Warner Brothers believed his dashing good looks and muscular build would be a sure bet at the box office. He became the star of Murder at Monte Carlo and Warner Brothers-Hollywood studios signed him immediately. 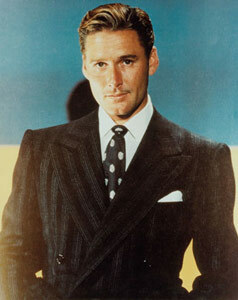 Errol Flynn was soon the "debonair romancer" of the world. By the end of 1935, Flynn had acted in five movies, taking the lead in two of them, Murder at Monte Carlo and Captain Blood. He married French actress Lili Damita and they had a son, Sean. 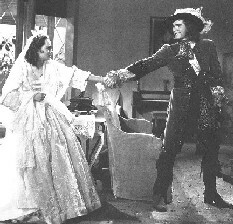 Captain Blood was nominated for best picture and contrived the swashbuckler image that marked the rest of Flynn's career. Known as his "pinnacle years," Flynn claimed absolute stardom between 1936 and 1942. His continuous roles as the noble, brave and handsome hero created a similar personal image for Flynn. Six of his best pictures, including The Charge of the Light Brigade, The Adventures of Robin Hood, The Dawn Patrol, The Sea Hawk, They Died With Their Boots On and Gentleman Jim, were filmed in this time. When World War II began, Flynn watched as thousands of troops were being sent overseas. He wanted to serve in the war but was dismissed because of health problems. Instead, he participated in U.S.O. tours for the troops in Europe with several of his Hollywood friends. He and Lili divorced in 1942, and within a year there was a new Mrs. Flynn. He married Nora Eddington and the couple had two daughters, Diedre and Rory, during their six-year marriage. Over the next 10 years, Flynn acted in several films. One of the box office hits was The Adventures of Don Juan. Flynn's handsome face and romancing reputation helped him to create the perfect Don Juan. Aside from their love affair with the leading man, audiences loved the film's creative set and action sequences. The 1950s were not as productive for Hollywood as the past years had been, and many actors' careers began to fade. Flynn met his third wife, Patrice Wymore, while filming Rocky Mountain in New Mexico. Flynn left Hollywood in 1952, settling on the yacht Zaca as home base for six years in Palma de Mallorca with Patrice and their young daughter Arnella. When Warner Brothers released the documentary film about Flynn's voyage from Mexico to the South Seas in 1952, it reflected a lesser-known Flynn. He loved the water and found the most comfort there, as it reminded him of his home and his family. Errol Flynn suffered a heart attack and died on October 14, 1959. Flynn was put to rest in Forest Lawn cemetery in Glendale, California. Many Hollywood celebrities attended to say their last goodbyes to a dear friend. Flynn led a full and interesting life, possessing a love for acting, the ocean and also writing. He wrote books like Beam Ends (1937), Showdown (1946), and his autobiography, My Wicked, Wicked Ways. He also co-authored several screenplays throughout his years in Hollywood. He is remembered as one of Hollywood's legendary figures, having starred in over 60 movies during his short 50 years of life.